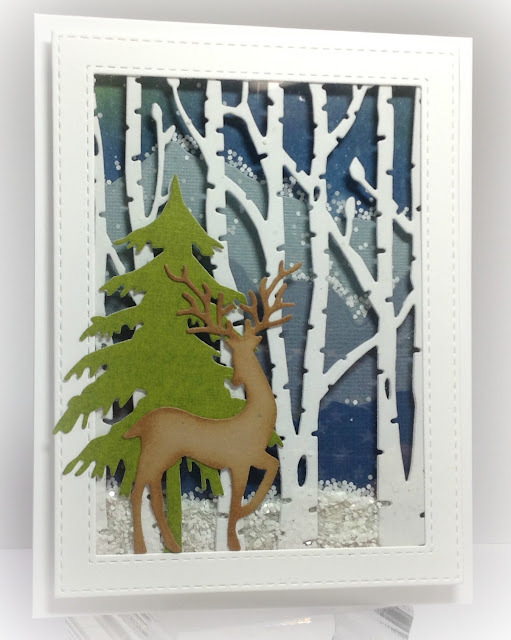 Hello friends~ Birgit here with you and today I've got a snowy shaker card for you. 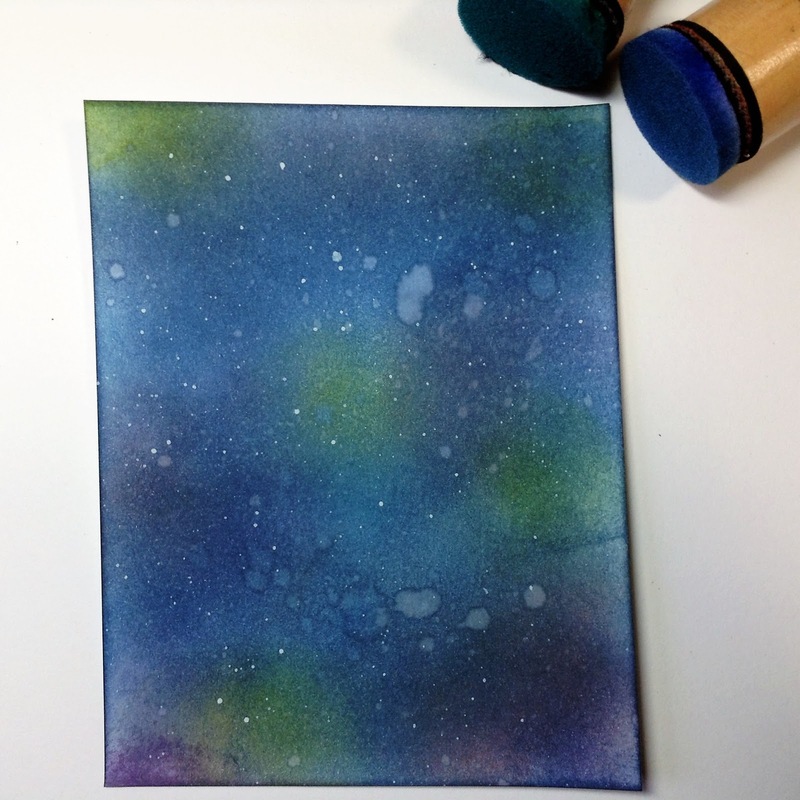 I started by creating a night sky background by blending some distress inks, splattered with water and then splattered with white paint. 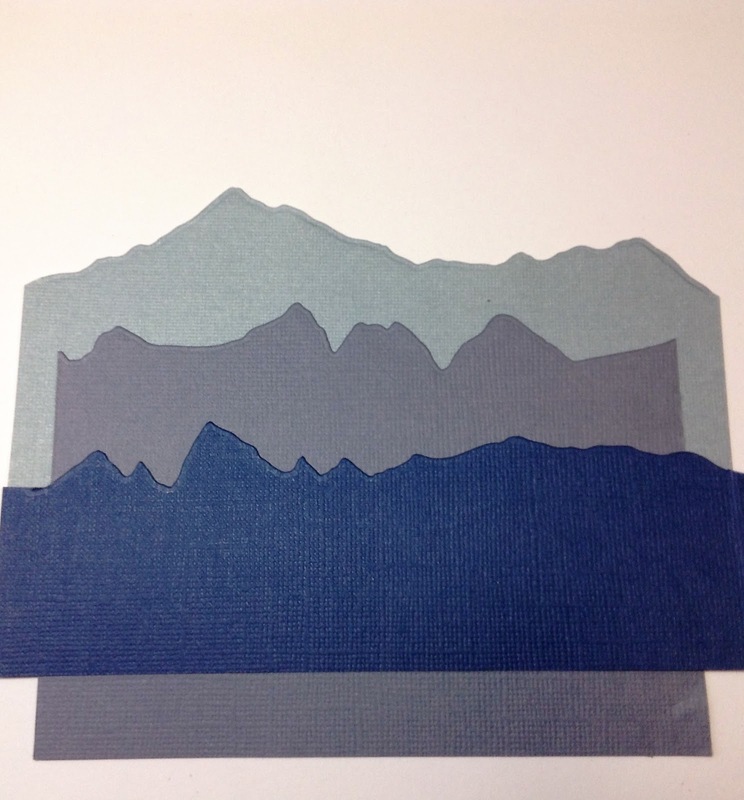 Next I cut some Impression Obsession Mountain Landscape Layers and laid them out and added the distressed panel behind the mountains. 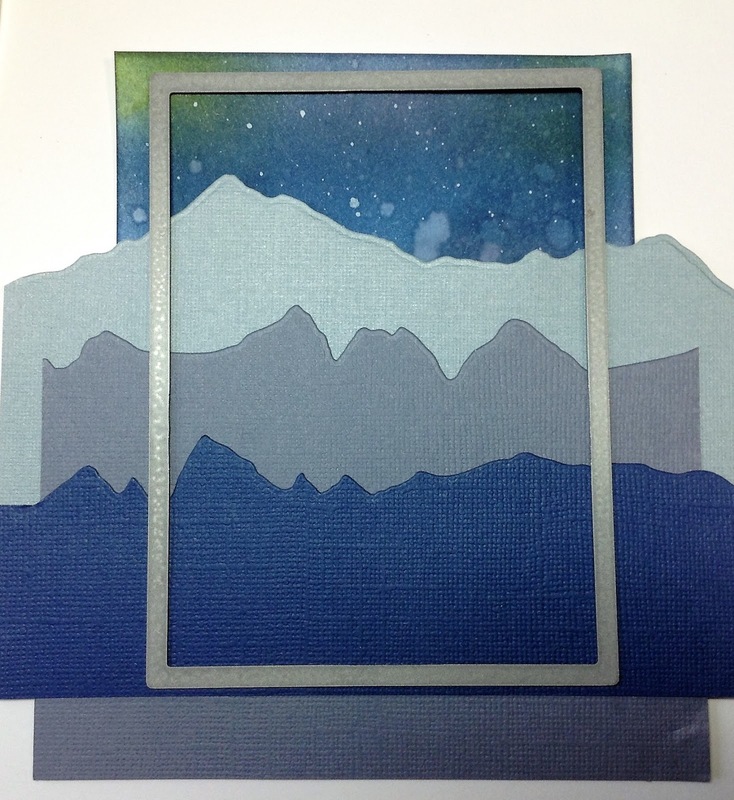 Then I cut the panel using a Memory Box Open Studio Stitched Rectangle Die and attached that to the front of a white A2 card base. 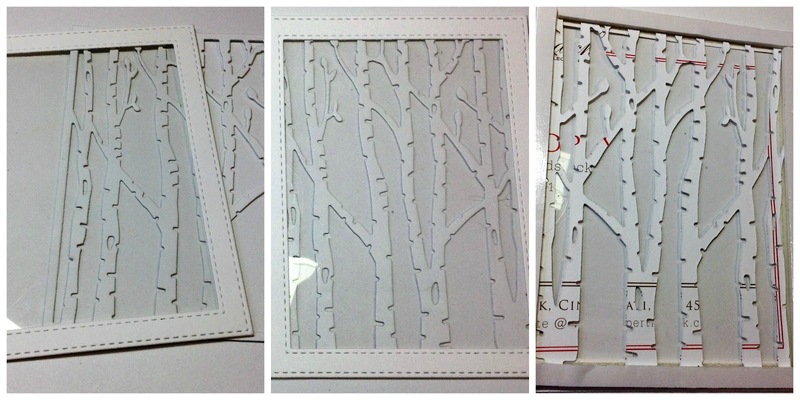 I cut all the parts for my card, including the Frantic Stamper Vertical Birch Trees, which I cut twice out of white card stock. 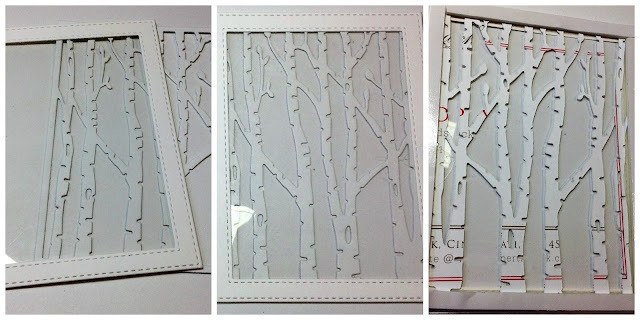 I layered the two birch tree dies to add a little thickness. Some icy cold snowflakes were sprinkled onto the card front and then I adhered the window panel over the top. There's the shaker part of this card all compete! 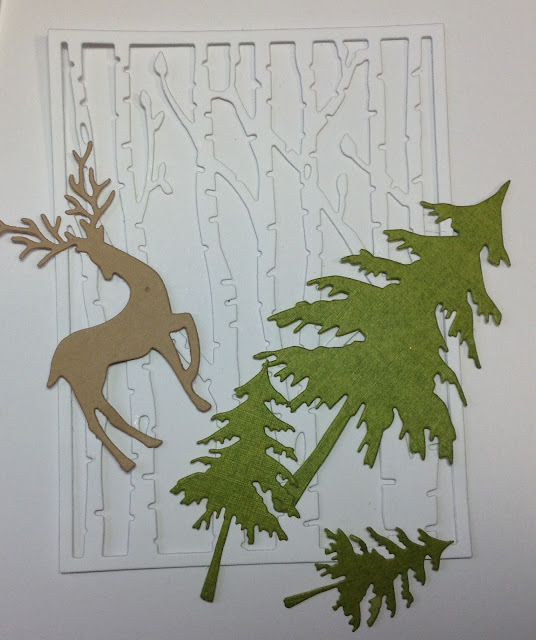 I added the largest fir tree from Impression Obsession Fir Trees and a Dee's Distinctively Dies Deer. I rubbed a little bit of distress ink around the deer and his antlers. And two smaller fir trees on the right side. I couldn't decide if I liked the card better with just one tree or all three. Which one do you like better?? Wow....your card is stunning Birgit! Such a beautiful, wintry scene. 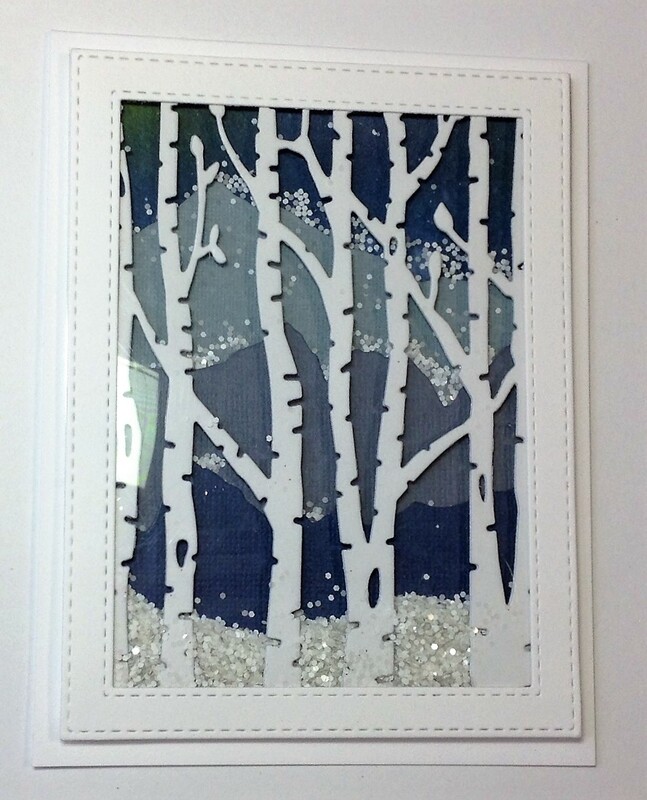 I love how the snowflakes attach themselves to the mountains, as well as creating lots of snow on the ground. 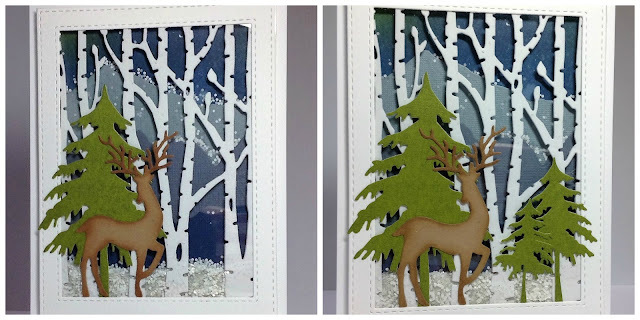 Fabulous tutorial, you are so inspiring and using more than one tree works just perfectly too. Amazing card, Birgit. 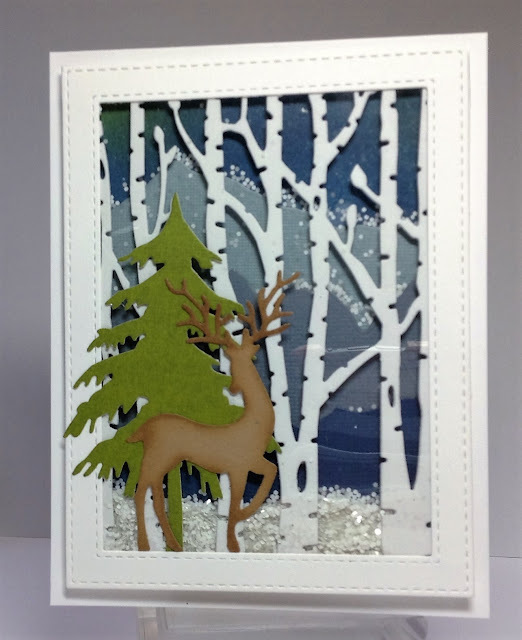 I never thought to use the Birch Tree Card Panel as a shaker card. I love everything about this card! Great card Brigit! Love it. WOW this is brilliant Birgit! 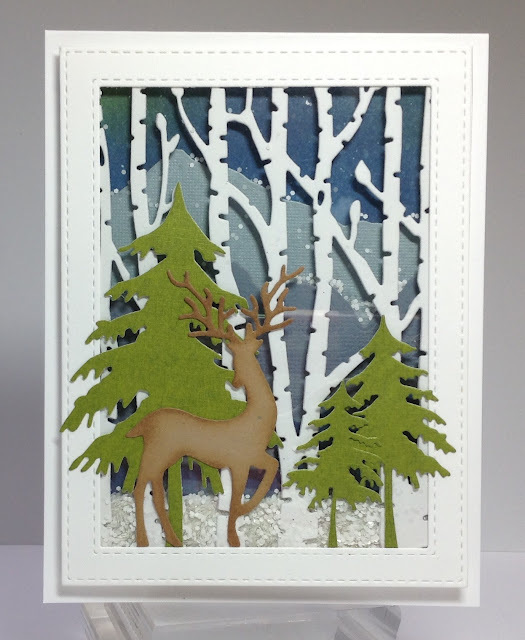 LOVE this wintry, woodsy scene and what awesome inspiration! Thanks for all the details ... BEAUTIFUL! Love, love the background. Your tutorial is magnificent. Truly a work of art and beauty. the layers are divine! beautiful card! Wow this is just amazing, I love the background and your layering of all the dies is terrific, wonderful scene!